Prepared on Notepad by Ian Smith, This page created 1st August 2000, updated 9th January 2003. Best on 800*600. The story of the Plaxton Darts is one of amazing success. 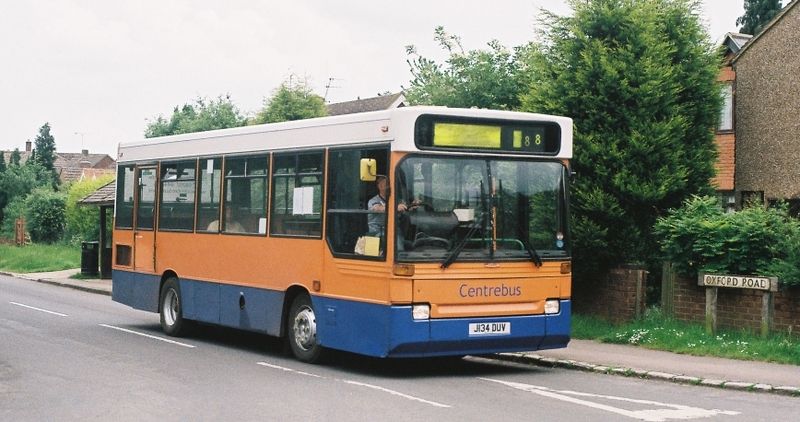 The conservative cuboid body that Plaxton subsidiary Reeve-Burgess put on the Dennis Dart chassis was an instant success. Perhaps it was just not so futuristic as the DT, or as retro as the DW, but for whatever reason they began to sell like hot cakes. 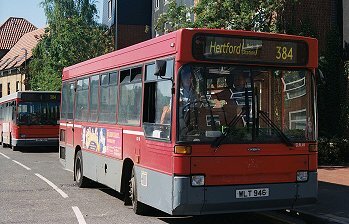 Production soon shifted to Plaxton's main works. London Buses ordered 153 on the shortest 8.5m chassis. They featured a split doorway, giving a low step for the less agile, but a higher front step giving a decent front clearance. With a 7ft 6in (2.25m) width they were a go-anywhere little bus. They went in 1991-2 to the London United, Westlink, London General, South London and Metroline subsidiaries, mainly for suburban and estate penetration work, replacing "breadvans", with a "Harrier" logo and brand-name.The long-lasting red paint has gradually darkened in the London atmosphere, to a dark crimson bordering on black in some instances. 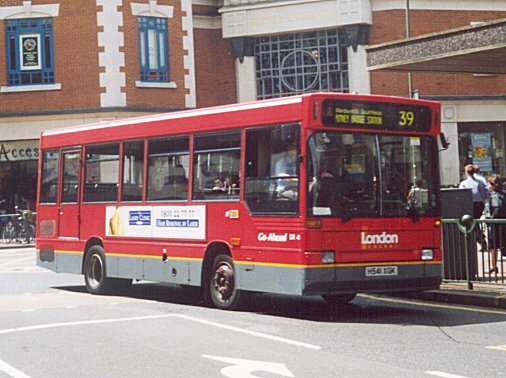 London United, together with subsidiary Westlink, made very widespread use of their 103 in their territory, and eventually used them from all garages. 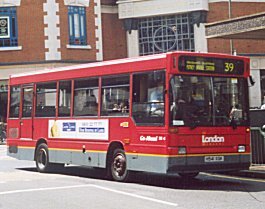 London United dedicated some to "The Heathrow Connection" routes until bigger buses took over. 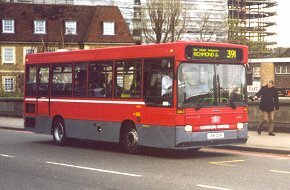 Some of the buses were repainted with grey roofs, or Westlink flashes, but others retained their original London Buses livery, increasingly melanistic, with fleetname changes. March 2000. DR116 crosses Kew Bridge under a thunderous sky, while earlier in the day DR71 enjoys the sunshine in Richmond. Click for larger pictures. 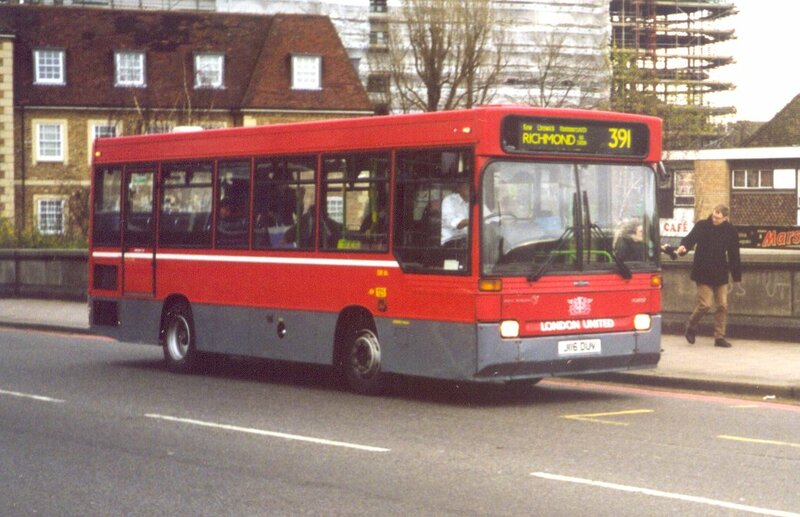 During 2000-2003 the London United DRs were replaced by low-floor wide-entrance buses as required by new tenders, leaving refurbished DR131 to work on into May 2003 as a singleton spare at Tolworth. Putney buses. Short DR41 and 43 enjoy the sunshine in Putney in June 2000, on local round-the-houses routes 39 and 170 for London General. Click for larger pictures. 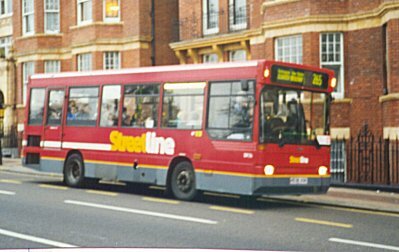 Above: Putney Bridge Station, June 2000. London General DR149 and DR52 keep company with Metrobuses between turns. Metroline had thirty-two, but the purchase of London Northern caused some redistribution. North Wembley kept some for the PR2, and but some went to Potters Bar for the 383 and W4, and a few to North Acton for the 268. A few were in special supermarket service liveries. 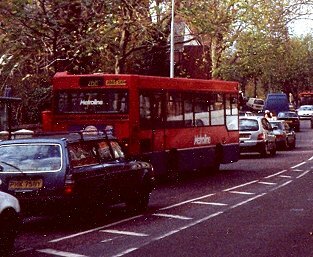 A grey day in Hampstead, November 2000. 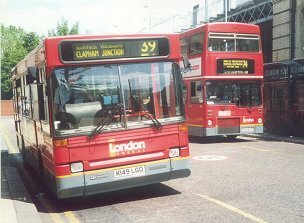 DR91 and DR95 climb towards Golders Green on the 268. Sales of earlier examples started in June 2000, and another large bunch were sold in mid-2001, displaced by newer low-floor vehicles. South London had twelve, but these were loaned to Limebourne for use on the G1, which was sub-contracted to Limebourne by London South. 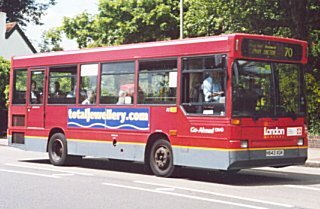 Connex took over the contract, and finally returned the buses to Arriva at the end of 2001. Arriva promptly sold most of them. 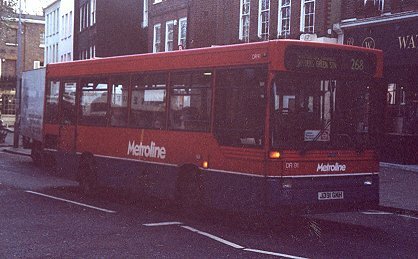 In August 1991 Metrobus of Orpington bought seven short Dart/Plaxtons, to replace Mercedes Midibuses on its 351 back-roads route between Bromley North and Penge. 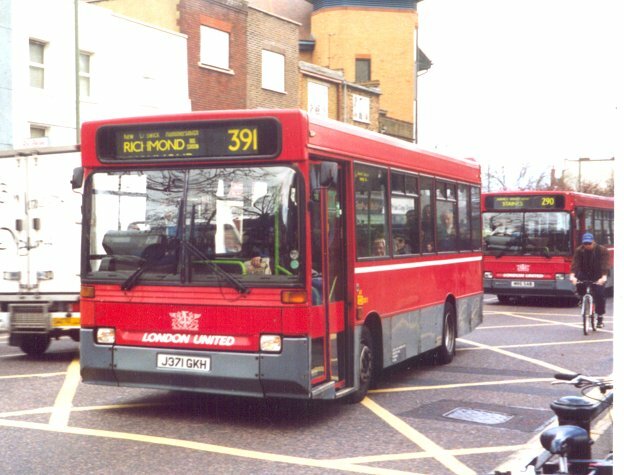 They also worked the London 146 , taken over from Crystals, on weekdays, and extra Sunday journeys on London & Country's 493 route. Sunday journeys on the 357 were also taken over by the new Darts. 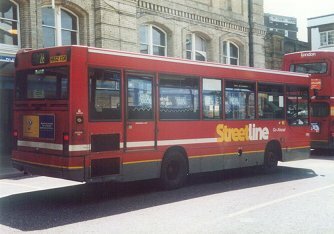 They made other appearances as well, such as on the Summer Sunday 746 service, when this was not being operated by RF255. 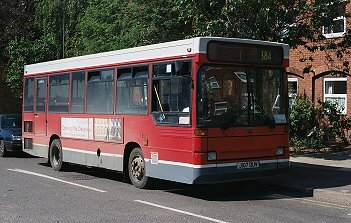 The whole batch was sold to the Birmingham Coach Company in January 2002. London Transit, a small company based at Hare Street near Buntingford, bought several short Darts from London United: DR1, DR53, DR57, DR68, DR102, DR107, DR111, DR128 in early 2002 for use on Hertford and Bishops Stortford services such as the 384 and 351. 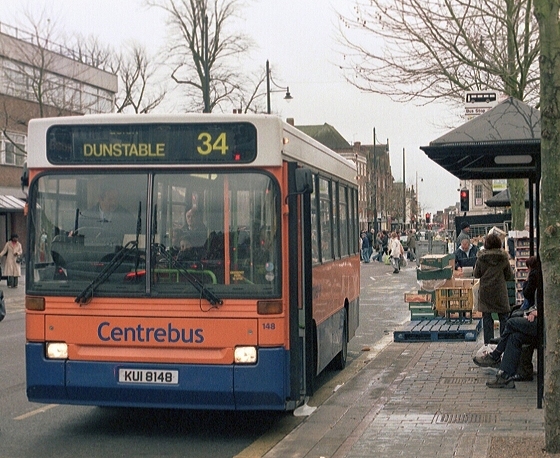 DR107 and DR111 wait at Hertford Bus Station late on a June Saturday afternoon in 2002. They still wear old colours, DR107 in London United livery, and DR111 still in old London Buses "tape-grey" livery. 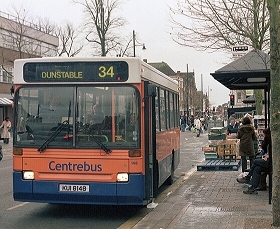 Centrebus of Leicester bought the St.Albans operations of Sovereign in January 2004, then amalgamated its Hertfordshire/Bedfordshire operations with LQT Ltd, Refresh Solutions and Lutonian Buses. 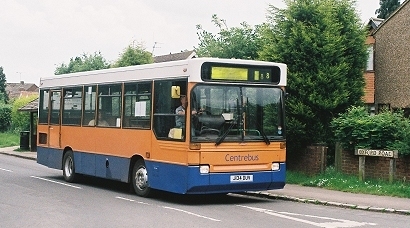 The combined fleets have gradually acquired Centrebus orange and blue livery, and include Darts with varied bodies and lengths. 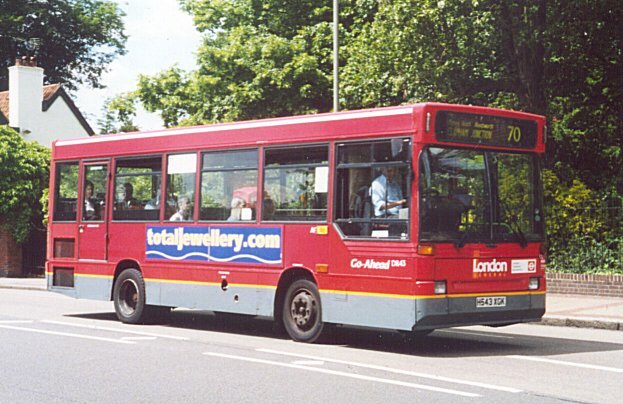 Included are six 8.5m Plaxton Darts from a variety of London Buses companies. These have been progressively moved north during 2008. Ian's Bus Stop Dart index. DW. DR. DRL.